File Oct. 9, 1975: Sunnymede Elementary School math teacher Dan Sells and 80 sixth grade students collected bottle caps as part of a class project. The students gathered more than 1 million bottle caps, which weighed 2.5 tons and would have stretched more than 16 miles if laid edge-to-edge. The year for this week's History Journal post was decided in a vote on Twitter. There will be more votes coming up, so follow us on social media to help decide what you see here! This week, we're looking back to a Sunnymede Elementary School on Oct. 10, 1975. 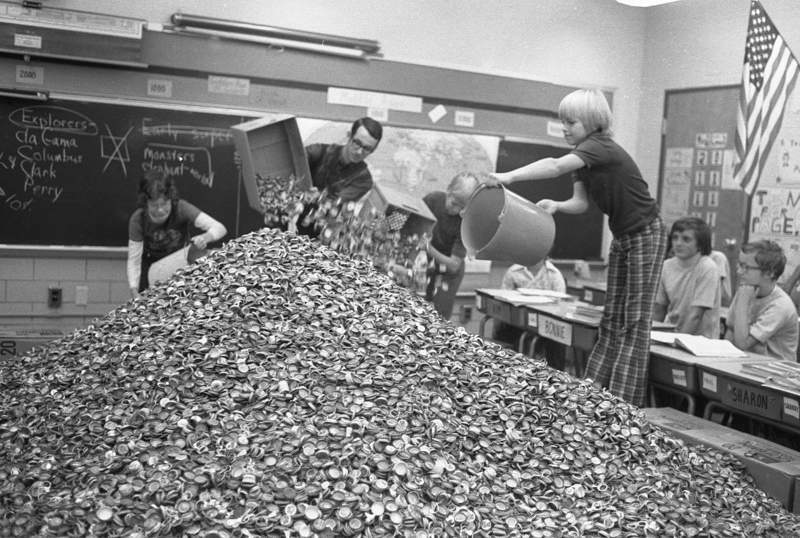 Math teacher Dan Sells and his sixth-grade students add to their pile of 1,006,000 bottle caps. The caps were collected as a teaching aid, and the students were hoping to sell them for 8 cents a pound to raise $400 for a trip to see the Sears Building in Chicago. The New Haven School is now closed. To comment or make suggestions for History Journal items, email Corey McMaken at cmcmaken@jg.net.